Painting over a concrete floor that has glue on it can present some issues. Removing the glue completely using an adhesive remover would be the best way to proceed, but if removal isn't possible, you can still paint a concrete surface covered in glue. All you need to do is create a clean, smooth surface to which the paint can adhere. 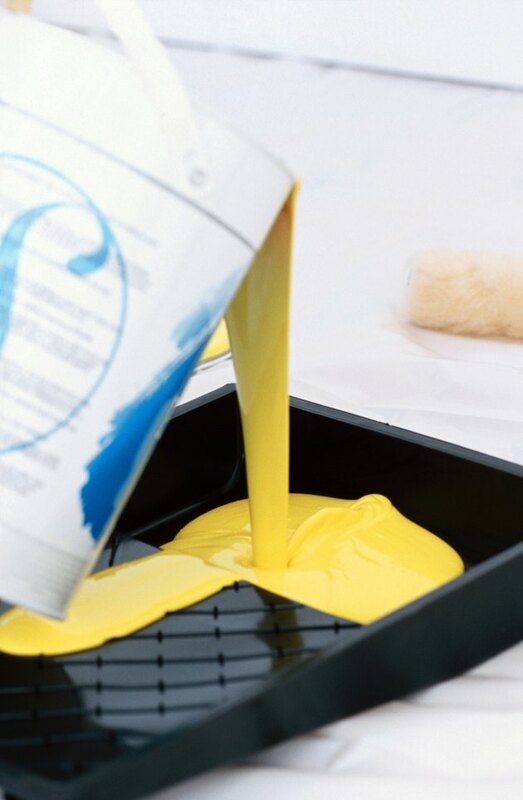 Cover a concrete floor with glue on it, using an epoxy paint for adherance. Remove all dirt and debris, using a stiff-bristle broom. Remove as much of the glue as possible from the concrete, using a concrete floor grinder. Run the grinder over the glue in rows, overlapping each row by about 3 inches to ensure complete coverage. Keep the grinder moving to avoid taking off a layer of the concrete, along with the glue. You can rent a floor grinder at an equipment-rental and home-improvement store. Sweep the floor a second time to remove the dust left from the grinding process. Mop the floor with a pH-neutral cleanser and a rope mop. Rinse after mopping with clean water, and then allow the floor to dry for about six hours. Attach a strip of masking tape to the base of the walls. Prime the floor with an epoxy primer. The epoxy will adhere to the glue remaining on your floor. Brush primer along the edge of the floor, creating a perimeter of about 4 inches. Cover the rest of the floor with primer, using a paint roller attached to an extension pool for extended reach and quick application. Roll the primer from the edge of the floor to the center, working from the still wet epoxy strip along the edge. Always begin new roller strokes from an already placed wet stroke, and start coverage from the corner farthest from the room's entry, working your way toward the door. Allow the primer to dry overnight. Cover the primer with two layers of epoxy paint. Use the same application method for the paint layers. Wait about two hours between applying the first and second layer, and then let the second layer of epoxy dry for 72 hours before you use the surface. Can Epoxy Paint Be Applied to Wood Floors?